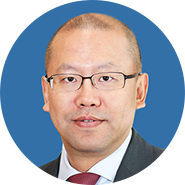 Houston Huang is the Head of China Global Investment Banking. He joined J.P. Morgan in 2015. Prior joining the firm, Houston spent 5 years in Goldman Sachs, where he was Head of China Industrial Group, responsible for coverage of key franchise clients within Investment Banking Services in China. And he spent 11 years at China International Capital Corporation Limited (CICC), where he was Head of European Investment Banking, Head of the Business Development Committee and Human Resources Committee on Investment Banking, and a member of the Investment Banking Operation Committee. With over 20 years of investment banking experience, Houston has led the execution and coverage of a large number of well-known privatization, fundraising and M&A projects in the Chinese oil and gas, banking, auto/machinery and healthcare industries. Additionally, Houston was a leading advisor to the State Council and other authorities for the Chinese Healthcare Reform Program. Earlier, Houston worked at Crosby (UK) Limited in London and Peregrine Capital Limited in Hong Kong respectively. Houston earned an MBA from the Lancaster University Management School and a BSc in the Science of Materials and a BSc in Economics and Management from Tongji University. He is a qualified corporate finance representative registered with the Financial Services Authority (FSA) in the United Kingdom and the Securities and Futures Commission (SFC) in Hong Kong. Houston is also registered with the Chinese Securities Regulatory Committee (CSRC) in China.